On this page you will learn how to judge different phase shifter concepts based on a single characteristic that is of huge importance, especially if you are considering using the phase shifter in a phased array. 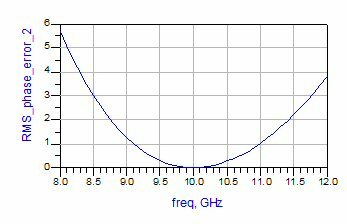 That characteristic is the ability to provide a flat phase shift over frequency. In a phased array, when you steer the beam, you adjust the phase of the elements so that individual signals line up at the desired beam-pointing angle (theta). Having phase settings that don't change with frequency help keep the beam pointed where you want it when you shift frequencies. Update November 2012: Thanks to Jörg, we are going to clarify when this "important characteristic" applies (and doesn't apply). Flat phase shift is best used in phase arrays that are "electrically large", where the full phase shift needed for true time delay is impractical. In small arrays, delay line phase shifters might actually be better! In order to decide for yourself, should analyze this question: what would be required for true time delay beam steering? Here are two examples that we put into a simple spreadsheet, to determine how practical true time delay steering would be. First is a 10 GHz radar with one meter diameter, and 60 degree scan angle. This might be similar to a large, expensive AESA for fighter aircraft. Notice we don't provide any exact information here, as specifications for fighter AESAs are under ITAR control. The second example is for a 77 GHz automotive radar which is practically a toy compared to the fighter's AESA. Here we chose an array diameter of 12mm and scan angle of 15 degrees. You might argue that an automotive radar would be just a one dimensional scanned array, so it would not have a "diameter" but pretend we meant "width"... While we're on the subject, the car radar would probably use a Rotman lens instead of a true phased array, in order to eliminate the need for 77 GHz phase shifters. In the 10 GHz array, the diameter is 33 wavelengths long, and at 60 degree scan a total delay of almost 29 wavelengths are needed. Assuming 11.25 degrees least significant bit, the phase shifter for true time delay steering would require 9 bits with the most-significant bit (MSB) of 5760 degrees. Putting that requirement into the time domain, the LSB is 3 ps and the MSB is 1600 ps. If you were to create such a phase shifter, it would require 18 SPDT switches and some interesting amplitude equalizers, and it would be called a time delay unit (TDU). Having all that loss in one place would be a bad idea, you would need to add some amplification, and it gets quite difficult to fit all that into the 1/2 wavelength lattice spacing. No large phased array uses true time delay for beam steering, but some experimental work has been done on "medium" sized arrays. Just go to DTIC and search for "TELA".... notice we said "medium" and not "large"... There used to be some further information on the TELA TTD phase shifter on rfalliance.org but that web site seems to have gone belly up. Maybe they couldn't afford GoDaddy's $1.99/month host payments? Actually, what happened is they lost their government funding. Good thing Microwaves101 is a hugely profitable private enterprise! And good thing we downloaded the TELA powerpoint presentation when we first saw it! You can find it on our TDU page. In the second case, the 77 GHz radar that is 12mm wide requires only 0.8 wavelengths of delay. Therefore a four-bit phase shifter is all that is needed (180 degree LSB), and a switched line architecture would be preferred to constant phase. Note that if you doubled the width of the array, you would need five bits and the MSB would be 360 degrees. How many COTS sources are there for such a part? None. COTS phase shifters by and large have MSB of 180 degrees, and provide constant phase shift. Here is a good example. How do you know which solution is right for you? Ask us and we'll provide that spreadsheet, or create your own. 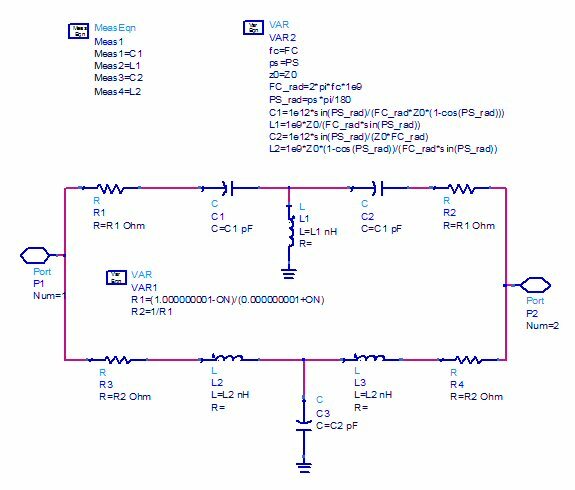 The question to ask yourself is, can I make a phase shifter that provides all of the bits for true time delay for my application? If you can't, then use constant-phase phase shifters. I would still assume that true time delay is better for a small array and/or small beam angles and wideband signals - as long as no large phase delays (several or many 360°) are required. 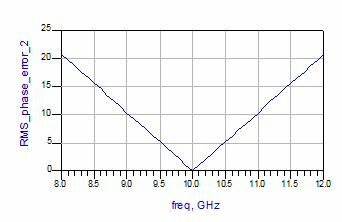 An ultra-wideband signal would suffer some frequency-dependent squint. ... but with the hint to large arrays your point became clear: With a constant-phase approach you are making use of the fact that with constant "binary" phase steps (delta_phi of 180°, 90°, 45°, 22,5 ° etc. ), the "long" phase delays at a large array add up to exactly n*360° + m*delta_phi, which can exactly be generated with the constant-phase phase shifter (neglecting the n*360° part). Therefore, the phase error is much smaller than for a true time delay, where one would need multiples of delta phi, which is not a "binary" step at any frequency outside the design frequency. On the other hand, the beam angle will change with frequency for the constant-phase phase shifter, but that can probably be tolerated. Good stuff on phase shifters etc, there is another point to remember and that is bandwidth of received or transmitted signal. Think of a symbol of QPSK occupying a length of path as it flies towards the antenna at a low angle. It will hit one edge of the antenna then smear across. If it hasn't crossed entirely by the time the next symbol arrives, you'll get inter-symbol interference. A timed array would get round this problem because the signal from each element would be delayed appropriately before summation. Note to readers... the switched delay line is just one way to create a phase shifter that has phase shift that varies with proportionally with frequency.... see our discussion of quadrature phase shifters for another example. Suppose you were to make a four bit phase shifter, two different ways. In the first phase shifter, you use nothing but delay line bits. Shown below is a simple ADS schematic of a two-state delay bit which provides 180 degree phase shift at 10 GHz, the other bits would look similar. R1 and R2 allow the parameter "ON" to set the phase state, if ON=1, the delay line is connected, if ON=0, the delay line is bypassed. 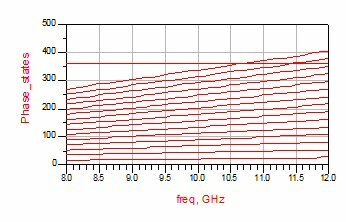 Shown below is a schematic of a high-pass/low-pass phase bit that is parameterized so that its phase is set by "PS", its center frequency is set by "FC", and its characteristic impedance is set by "Z0". Again, R1 and R2 allow the "ON" parameter to control the state. 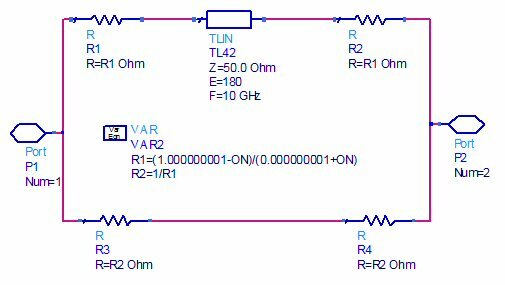 Using the multi-state ADS phase shifter circuit, let's compare the phase states across frequency, and the RMS phase errors. In the delay line phase shifter, phase errors quickly degrade as you move away from center frequency. The filter-based structure has much more bandwidth when it comes to phase error. So, at the center frequency, either approach will provide (in theory) zero degrees phase error. If you need bandwidth, the delay line phase shifter quickly falls apart, while the filter-based phase shifter does not. If you have ever designed any microwave circuits, you know that they don't always function like the simulation, and center frequency of a design often shifts up or down. Therefore, you should avoid the delay line phase shifter when possible. Now let's look at the bandwidth implications of having a constant phase shift over frequency, versus a delay line, when you are designing or operating a phased array system. We used the phase array spreadsheet that is available in our download area to create these charts. We set up a four-bit phase shifter, centered at 10 GHz, with element spacing lambda/2 (1.5 cm), and we scanned off to 45 degrees. 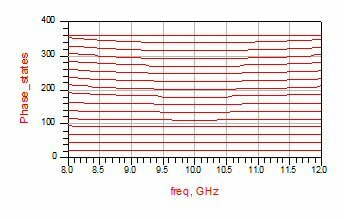 Then we shifted the center frequency to 12 GHz while keeping the 10 GHz calibration. By "calibration", we mean the phase settings. Below is the result, using a constant-phase phase shifter. The pattern is slightly shifted from 45 degrees, but the gain is almost unaffected (the radial axis is magnitude of field intensity). Sidelobes are slightly higher. Now look what the result is if you used delay-line phase shifter bits. The angle is off slightly more, but the magnitude has dropped significantly and more sidelobes are popping up. You have just killed the gain of your antenna! Note that there would be no effect if your phase shifter provided true time delay, a topic we'll deal with in the future. True time delay for every element across an entire phased array is almost impossible to pull off. In real life, few phased arrays have the bandwidth be able to jump 20% in frequency without at least using a different calibration file. But the point we are trying to make is that a constant phase shift is a better characteristic than a constant delay line, when you are building a phased array, you'll get more bandwidth, and fewer calibration files are needed over frequency.